Frustrated that her acting career isn’t progressing in the manner she hoped, Yeon-shin (Shin Dong-mi (신동미) decides to quit the profession and walks out on her director. Her anger is such that she fights with old friends and in a moment of unbridled immaturity, breaks up with long term boyfriend Woo-yeon (Kim Kang-hyeon (김강현). Time passes and Yeon-shin, feeling sorry for herself, visits a hilltop to gather her thoughts where she encounters an unorthodox detective (Yu Joon-sang (유준상) with a talent for interpreting dreams. A Matter of Interpretation (꿈보다 해몽) is perhaps best described as a quirky, surreal comedy-drama with Hong Sang-soo-esque stylisation, which makes sense considering writer/director Lee Kwang-kuk (이광국) worked with the auteur as an assistant director on several of his films. Through the incorporation of witty conversations and humourous encounters however director Lee has made A Matter of Interpretation arguably more accessible for audiences, which should appease critics of Hong’s work. 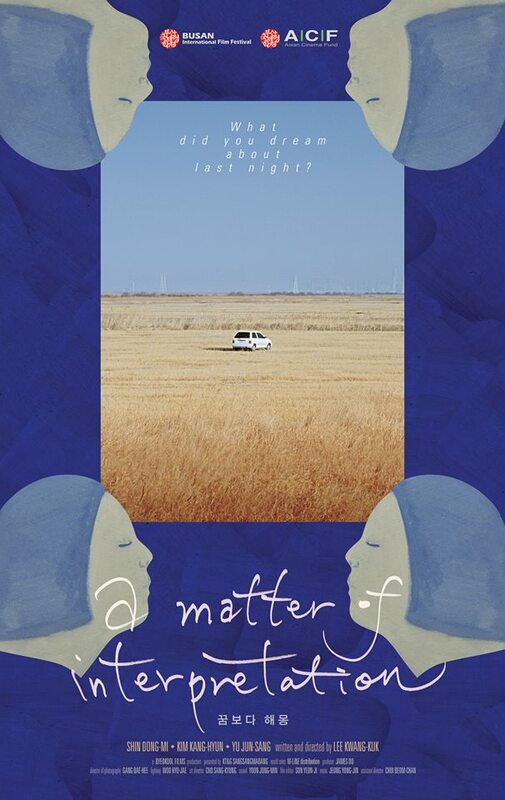 His second feature following the acclaimed Romance Joe, director Lee’s A Matter of Interpretation is a highly enjoyable affair and one that rewards repeated viewings due to the nature of the narrative. The story chronicles the fraught lives and relationships of the central characters yet focuses primarily on how such issues present themselves through dreams, and watching the reenactments unfold is a consistently surreal and entertaining experience. Yet rather than a Freudian analysis, director Lee attempts to interrogate the notions of life and happiness within contemporary Korea through symbolism, touching on a range of social issues with wit and ingenuity in the dream-like spaces within the film. Central to the enjoyment are the fascinating assortment of characters, particularly the wonderful acting and comedic timing by lead actress Shin Dong-mi. Shin is superb as sassy frustrated performer Yeon-shin, with her sharp-tongued insults and bad-temper consistently funny as well revealing her own subconscious issues. She portrays Yeon-shin’s trajectory extremely well, which along with that of her boyfriend, form a genuine and insightful examination of couples who reach a certain period in their lives. Meanwhile frequent Hong Sang-soo collaborator Yu Joon-sang brings expert timing and a charismatic aloofness to the film as the detective. His delivery of dialogue, notably his dream interpretations, are engaging and humourous yet he also manages to convey a sense of tragedy to the character, adding complexity to a role that could have been bland in lesser hands. Yet for all of the enjoyable and interesting moments throughout A Matter of Interpretation, the film suffers from an inconsistent tone and fragmented narrative that ultimately leads to a story that fades in and out of being compelling. Such issues arise when focus is directed away from Yeon-shin towards the detective’s and, to a lesser extent, Woo-yeon’s dreams and backstories. From the very beginning it is Yeon-shin who is the fascinating central character who has huge potential for growth, such is Shin Dong-mi’s performance, and in ascribing time to those around her Yeon-shin’s development becomes subsumed. That’s not to say that the cast are dull as they are consistently entertaining, however the fragmentation between the characters, the stories, and between reality and dreams itself results in a film that, while very enjoyable, lacks the potency it would have had through more engagement with Yeon-shin. A Matter of Interpretation is a wonderfully quirky and highly enjoyable second feature from writer/director Lee Kwang-kuk. The influences from his mentor Hong Sang-soo are clearly apparent yet Lee infuses his film with an alternative sense of biting wit alongside comedic – and often somewhat surreal – socio-cultural insight. Actress Shin Dong-mi shines as central protagonist Yeon-shin, while Yu Joon-sang is wonderfully charismatic as the odd detective. The film does suffer due to the fragmented narrative and inconsistent tone, yet A Matter of Interpretation is an entertaining take on modern happiness.